Welcome back everyone. I wasn’t planning on being gone this long but a great opportunity came up for me to get out of town and I couldn’t pass it up. I’m a sucker for value. When we left off in the last article, I said I was going to talk about buy listing in the next article. Before we get to that though, I want to go over the last two trades I made in greater detail. I want you to see that there is a method to my madness. I’ve already talked about the first trade. I traded some shock lands and a couple of cheap staples for a bigger stack of cheap staples, but for a few different archetypes. Most of you agreed with my end of the trade. 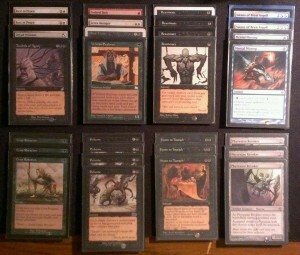 For reference here are the cards I traded for. 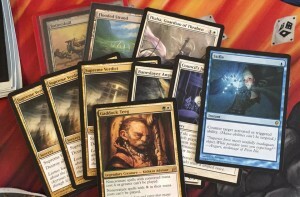 The Reanimator deck has been picking up some steam recently in the bigger events. A couple of my local guys have asked me about the deck and if I had any of the cheaper cards for it. 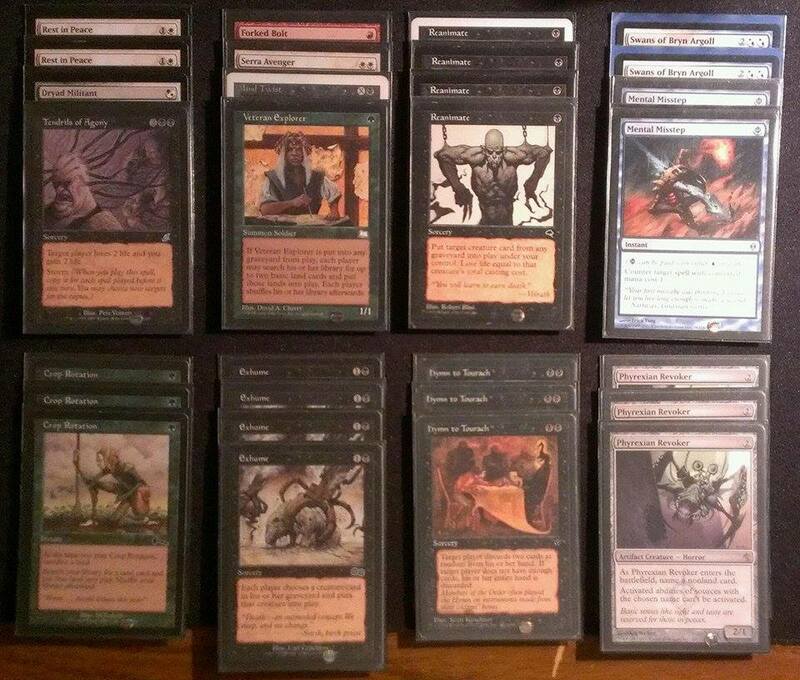 Reanimate and Exhume are cheap and easy to trade away to people testing the waters of the format. Trading out $20-$30 of cards to pick up a small stack of cards for an eternal deck you might make is easy to do without regrets if you don’t end up building the deck. Overall, this trade helped me diversify my trade binder. Having these cheap staples in my trade inventory should help me with my secondary goal of building my local legacy community while helping me with my primary goal of building the deck. A lesson I’m reminded of constantly is that my local trade partners don’t often get the cards I need for the Stoneblade deck. They tend to trade for the cards that they’re going to use in their deck project and not really worry about what they have in the trade binder. I had a foil Lorwyn Ponder rotting in my binder. I couldn’t give it away. I had put it in my buy list pile. (I’m terrible at buy listing by the way, but I will talk about that more later.) I was checking out what was posted in a couple Facebook buy/sell/trade groups when I came across someone looking for a foil Lorwyn Ponder. He valued it at $50 in trade. That’s pretty good considering I had decided that I was going to buy list it to Channel Fireball for $30 ($39 in store credit) a little while ago. 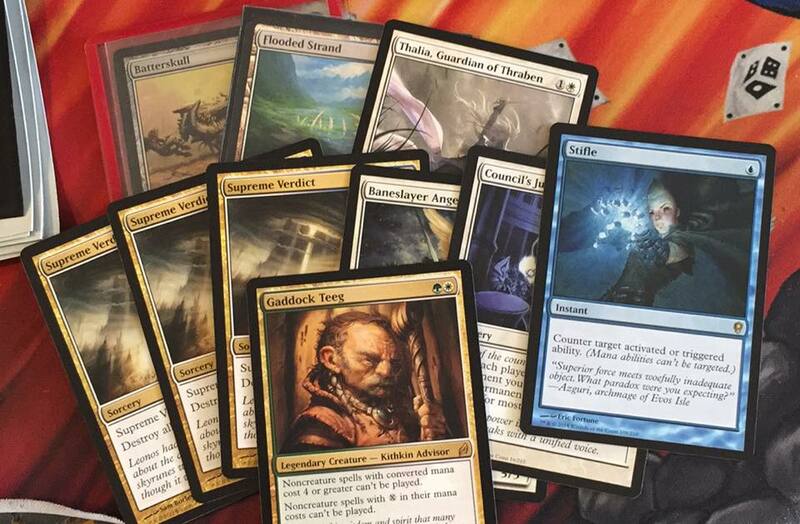 We talked back and forth and he offered a pair of Flooded Strands and a Batterskull for the foil Ponder. That seemed like a perfect trade for me. I get to trade a semi-expensive (it’s a common foil) card that is EXTREMELY hard to move into format staples that I could trade out the same day. After he doubled checked his cards, he let me know that he only had one Flooded Strand. He was using tcgplayer mid price for trade values. At the time (before Christmas) that left me with roughly $17 to snag out of his binder. I want to take a minute here and say that Dave Meetze is the perfect example of someone you want to trade with. He sent me pictures of his trade binder, the whole binder, to go through to find the difference. He is one of the most professional people I have ever dealt with. He went above and beyond the entire time AND he sent first. Great guy. Back to the trade though. He had a ton of stuff that I wanted to put into my trade binder but I needed to be efficient here. I had a great opportunity to add cards to my deck and my binder. I didn’t want to be greedy and loose all the value to the deck. I threw in the Sword of Light and Shadow from Modern Masters (I opened in a draft) with the foil Ponder for these beauties. So let’s breakdown the numbers here. Face value it looks like I made $2.00. But if we look at the tcgplayer mid prices today (1-5-15) you will see that I picked up another $10. So I’m up a little over $12 in this trade. The mid price on the Ponder went down $6 and some of the other cards went up a little bit. This is not an example of my awesome trading skills. This is an example of plain old luck by the way, not an example of my awesome trading skills( for the most part at least). Out of the cards I got in the trade I will be putting a fair amount of them in the deck. Council’s Judgement, Batterskull, and the Flooded Strand. Looking at the other cards, Supreme Verdict, Thalia, Stifle and Gaddock Teeg are all cards I expect to increase in price over the long term. Supreme Verdict and Thalia are under priced in my opinion. Thalia sees a ton of legacy play and I expect to see it in modern eventually. Supreme Verdict is one of the best wrath effects out there. I know Supreme Verdict has been on everyone’s radar as a solid speculation target. Speculation isn’t exactly where I want to be right now. I need to maximize my trade binder’s resources. I can’t afford to sit on specs long term. That being said, I get asked about Supreme Verdict enough that I like having a couple in my binder even if they don’t see a huge price jump. That leaves Batterskull and Baneslayer Angel. I fully expect Batterskull to be reprinted in Modern Masters 2015 and I wouldn’t be surprised to see Baneslayer Angel in there as well. The risk of the reprints is something to think about but not something that would prevent me from picking them up. Batterskull has the grand prix promo and it is still $17. Baneslayer has two core set prints and it is $12. There is some risk but since I plan on using both cards in the deck I’m not really worried about the card loosing value with a reprint. Sure, I could wait and see, then pick one up, but without anything being confirmed I would rather have the cards in hand. Not to mention I prefer the first printings of a card I’m using in a deck. Let me know your thoughts on the trade in the comments. I would love to see what you have to say. Now we get to talk about buy listing. Couple of quick tips to remember when you’re buy listing. First, always double check how many the store is buying. I’ve made a few mistakes when I first started buy listing. I’ve learned that lesson the hard way. Next is always make sure to squeeze all you can with the cash you’re spending to ship. Sometimes it makes sense to take a little less from a store if you already have a stack of stuff that you’re sending. I can fit a lot of cards in one of the $5.95 priority mail boxes. Last article I talked about the Titania, Protector of Argoth for $2.99 with free shipping. My budget was able afford 10 copies. I made sure to look at the buy list prices before I pulled the trigger. Channel Fireball was paying $5 and would take over 150 copies. I looked through my stack of cards to see what else I had to ship them. Add in the 10 copies of Titania, Protector of Argoth for a total of $145 cash or $189.15 in store credit minus the $6 to ship it. Let’s look at what I have in the cards to see the actual profit of this venture. Total cost of about $95. Cash profit of $44 after shipping. Store Credit profit of $88 after shipping. I love the idea of having $189.15 in store credit just for shipping in 26 cards. Average of $7.27 a card makes me pretty happy. I thought I would’ve moved the Chalice of the Voids by now but I haven’t had any luck. Taking $13 in store credit is close enough to what I would end up with after fees anyway. Stumbling across the Necrotic Sliver and Lancer in a local store’s bulk box helps the total as well. One of my favorite thing to do when I visit a store for the first time is to find these kind of boxes and scour them for these kind of cards. I love value! What do you think I should get with the store credit? The’re selling a heavy play Revised Tundra for $180 and near mint one for $220. Should I buy some under-priced Modern cards? Leave your suggestions in the comment section so we can go over it next week. I have put the collection I have assembled for the project into mtgprice.com’s collection tracker and it really is great. Being able to glance at your collection and get a quick idea the activity is great. It comes in handy when I go to an event just to trade. I’m working on putting in into a spreadsheet in google docs so I can try and get some additional trades going. Next week I will be going over the value I have in the deck so far, a few trades I have in the works, the fallout of the Legacy IQ I’m going to play in this weekend, and something else that I don’t want to spoil. Really looking forward to that. As always, follow me on twitter @somethingsays email me at mtglegacyhero at the gmail.